Daylight Savings Time is a semi-annual source of bewilderment. If anyone ever understood the point of the thing, they are long deceased. We don’t even need it as a reminder of when to change the batteries in our smoke alarms anymore, because smoke alarms now beep at us when their batteries are dying. Everyone hates the spring ordeal. Some people suffer genuine adjustment pangs every time. The rest of us just wonder which of our clocks have automatically set themselves and which need our attention. It is especially burdensome on people who actually have a Sunday morning scheduled activity. Someone always comes late to church, or early. 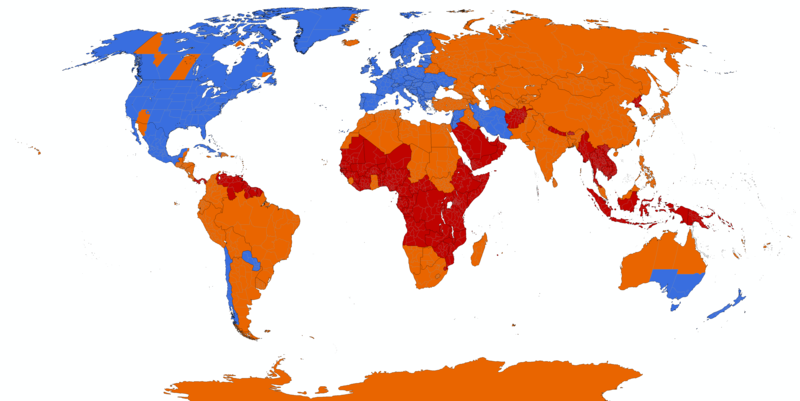 A glance at the map above shows that the world can’t even agree on whether or when to observe this outmoded ritual. What everyone agrees on is that the fall switchover is awesome. So here is my proposal: nix “Spring forward, fall back,” and just turn the clock back an hour every six months. It’s a little freebie, an extra hour of sleep* thrown in just to make life that tiny bit more sweet. *There would be no restriction on the use of the extra hour. You may use yours for playing videogames, snuggling your kids, watching reruns, even washing the dishes if you really want to make this about productivity. **Still what I’m planning to use it for. Sam refuses to comply with Daylight Savings. He says that the earth doesn’t switch times, and he’s siding with the earth. We change the clock in his room, and he changes it back. It was cute the first few years, and now (however admirable it is for him to buck the trend and show his anti-establishmentarianism) it’s just annoying. Getting rid of DST would make our lives easier, if only for eliminating a bump in his road. I have to admire his spirit and tenacity, as annoying as they must be to live with! If you tell him, during DST, “The movie starts at 7,” does he show up at conventional 7 or his own 7? I forget who said this first but “It’s like trying to make a string longer by cutting off one end and tying it on the other.” is my take on DST. It makes no sense. I have yet to hear a convincing argument for keeping it. Leave it to George W. to make it worse. The family energy expert says she thinks it’s supposed to be about saving energy, but that whether it really does would take some research. never thought that DST and reverse was that significant, but this proposal (?) makes it more so. A perfect reminder of our dependence on the celestial cycles, and sort of a way of controlling them? Wow! Here’s an odd thought>>>> as a native Californian and consequently ACHING for some kind of noticeable phenomenon to mark the change in seasons…. I embrace it! !